The 2nd installment of Google’s Great Online Shopping Festival is here – Rather than a single day like last year, this year has been converted into 3 day shopping event. We will bring you all the highlights of the event, along with all the deals that you should never miss. The article will be updated with more news. The 2013 GOSF extravaganza had a rough start and we were quite surprised at that. Generally, a Google backed event rarely has infrastructure or technical issue, but the start of festival was marred with that. We logged on to the site at exactly Midnight to check what #GOSF had on offer, and to my surprise, the site gave “server 500 error”. The error lasted for about half an hour, after which the previous “pre-launch” page was put up. Funnily it said, –1 days to go for festival. Though many believed it was traffic spike that bought the site down, we think it was a configuration issue with migration from “pre-launch” to “post-launch” GOSF page. It take quite a while for Google to correct it, but as of 6:00 am India time, the site was up and running properly. The GOSF site is much better structured than what it was as compared to last year. One of the reason is – this time close to 250 e-tailers have participated in the event making the site layout very important. As the site is geared towards attracting first time buyers, they can either “shop by deals” or “shop by style”. Shop by Deals shows sortable lists where buyers can see deals by range of discounts and offers, while “shop by style” lists down deals based on buyer’s interest. For example: the deals are sorted by what a “housewife” may find interesting, or what a “geek” may find interesting. Simple, the deals are just not good enough. 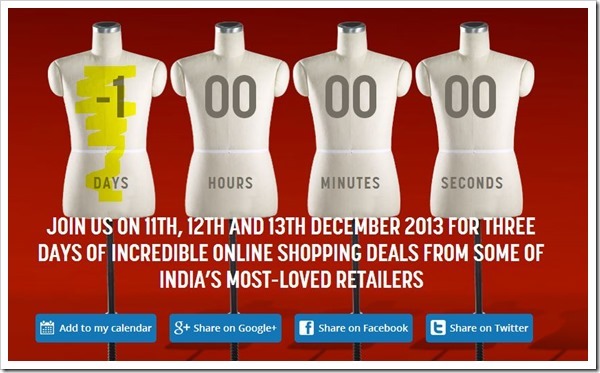 GOSF has been bought to India to replicate the “Black Friday/ Cyber Monday” kind of events in the west. During these days, best deals of the year on offer with retailers. However, the same cannot be said about GOSF, while the deals are good, in most of the cases they are no different from what has been on offer at different times of the year. So, though GOSF has attracted lot of eyeballs, only time will tell whether this buzz will convert into high number of transactions. 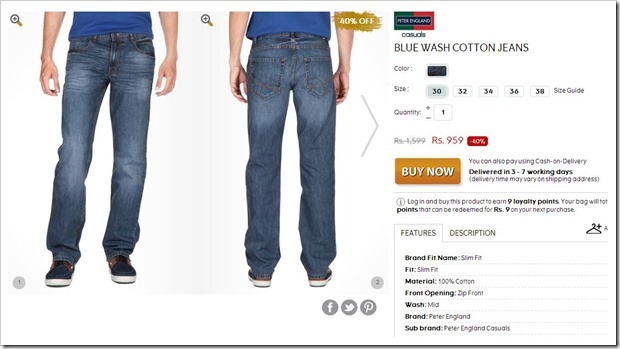 Now, the worse part – GOSF seems to be taking shoppers for ride. Yes, that’s true. Some of the deals listed on GOSF show lower price of products, but when you reach the actual site, the product price becomes higher. 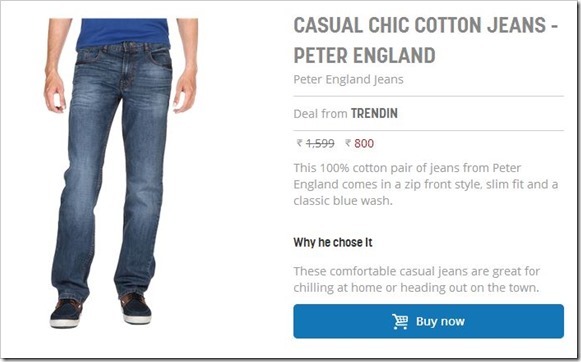 Here is an example: One e-tailer showed straight 50 percent off on Peter England Jeans. So the deal price listed was Rs. 800/- as against Rs. 1599/- retail price. See the screenshot here. However, when the interested buyer clicks on “Buy Now” and goes to actual site, the price shown is Rs. 959 for the same product. See the screenshot below. This is the worst part of GOSF – The e-tailers are showing extremely attractive prices on the products on GOSF site, but when it comes to actual purchase, the price is bumped up. Do visit GOSF, and tell us what has been your experience. GOSF 2013 Was a Bumper Hit, The Numbers Prove it! Google’s Great Online Shopping Festival: What’s the reason behind it?